In SAS 9.2, SAS/QC procedures provide enhanced traditional graphics and a new alternative for producing high-quality graphics. In addition, the ADX Interface for Design of Experiments provides several important new features. Traditional graphs produced by SAS/QC procedures are saved in graphics catalogs, and their appearance is controlled by global statements such as the GOPTIONS and SYMBOL statements, along with numerous procedure options. 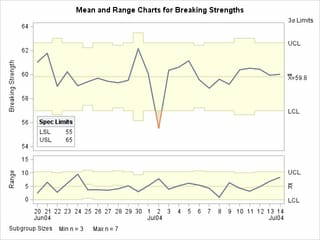 Before SAS 9.2, the default appearance of these graphs was primitive, and user selection of colors, fonts, and other attributes was necessary to produce attractive graphical output. 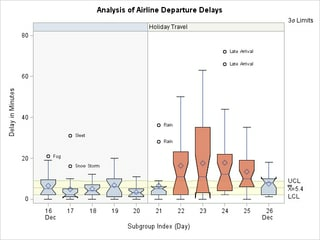 In SAS 9.2, as an alternative to traditional graphics, SAS/QC procedures can use ODS Graphics functionality to create graphs. This is an extension to the Output Delivery System (ODS) that is invoked when you provide the ODS GRAPHICS statement before your procedure statements. Graphs are then produced in standard image file formats (such as PNG) instead of graphics catalogs, and their appearance and layout are controlled by ODS styles and templates rather than global statements and procedure options. The ODS styles provided with SAS 9.2 have been designed to produce attractive, professional-looking graphics. ODS Graphics output produced by SAS/QC procedures is consistent in appearance with graphical output produced by other statistical procedures that are enabled to use ODS Graphics. ODS Graphics is supported on an experimental basis for SAS/QC in SAS 9.2. Both ODS Graphics and traditional graphics require a SAS/GRAPH license. In SAS 9.2, the default appearance of SAS/QC traditional graphics is also determined by ODS styles. The default values for graph elements including text fonts and heights, colors, and line styles all come from the ODS style, but you can use familiar global statements and procedure options to override the defaults and control every detail of your traditional graphics output. You can also prevent the ODS style from affecting the appearance of traditional graphics by specifying the NOGSTYLE system option before your procedure statements. Traditional graphics without ODS styles. If you are working with a SAS program written using a previous SAS release and you want to preserve the appearance of traditional graphics produced with SAS/QC procedures, you should specify the NOGSTYLE system option. Traditional graphics using ODS styles (the default). If you are writing a SAS program with SAS 9.2, consider using traditional graphics with ODS style-dependent defaults to take advantage of their improved appearance while retaining control over every detail of your graphs with procedure options. ODS Graphics. If you are writing a SAS program with SAS 9.2, consider using ODS Graphics for the highest-quality graphics output and consistency with output from statistical procedures and SAS/GRAPH procedures that are enabled to use ODS Graphics. Expanded catalog of mixed-level designs. The number of mixed-level designs has been expanded from 213 designs to 25,115 designs. You can now construct designs with up to 9 levels (originally 3 levels) and up to 513 runs (originally 108 runs). This enables ADX to be used in direct marketing, where design of experiments is playing an important new role. Analysis of unstructured experimental data. Before SAS 9.2, ADX could analyze experimental data only for designs that were formally constructed with ADX. However, in many situations experiments are informally designed. In SAS 9.2, you can import this type of data and analyze it with appropriate statistical and graphical methods. New graphical techniques. 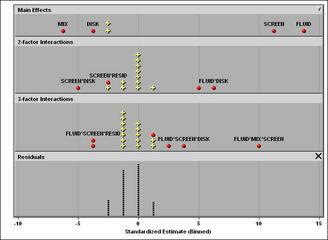 Two new graphical methods aid the analysis of fitted models. The graphical ANOVA plot displays effect estimates and helps you determine which effects are active. 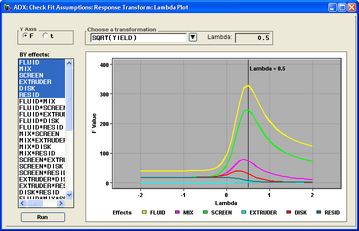 The lambda plot helps you decide whether a response transformation is required. 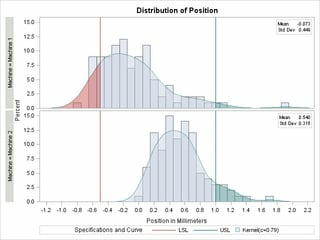 These techniques are especially helpful for users with limited statistical backgrounds.